Ahn AC, et al. Electrical properties of acupuncture points and meridians: a systematic review. Bioelectromagnetics 2008; 29(4):245-56. This study is a review of acupuncture research data, examining acupuncture points and meridians to ascertain whether evidence exists to support or refute the claim that acupuncture points and meridians are conduits for electrical signals. Abstract: According to conventional wisdom within the acupuncture community, acupuncture points and meridians are special conduits for electrical signals. This view gained popularity after anecdotal reports and clinical studies asserted that these anatomical structures are characterized by lower electrical impedance compared to adjacent controls. To ascertain whether evidence exists to support or refute this claim, we conducted a systematic review of studies directly evaluating the electrical characteristics of acupuncture structures and appropriate controls. We searched seven electronic databases until August 2007, hand-searched references, and consulted technical experts. We limited the review to primary data human studies published in English. A quality scoring system was created and employed for this review. A total of 16 articles representing 18 studies met inclusion criteria: 9 examining acupuncture points and 9 examining meridians. Five out of 9 point studies showed positive association between acupuncture points and lower electrical resistance and impedance, while 7 out of 9 meridian studies showed positive association between acupuncture meridians and lower electrical impedance and higher capacitance. The studies were generally poor in quality and limited by small sample size and multiple confounders. Based on this review, the evidence does not conclusively support the claim that acupuncture points or meridians are electrically distinguishable. However, the preliminary findings are suggestive and offer future directions for research based on in-depth interpretation of the data. Ahn AC, Martinsen OG. Electrical characterization of acupuncture points: technical issues and challenges. The Journal of Alternative and Complementary Medicine 2007; 13(8):817-24. Understanding the factors that affect electrodermal readings—including stratum corneum, sweat ducts, electrode polarization, electrode material, contact medium, electrode geometry and electrode arrangement. Abstract: Acupuncture points are frequently described as having distinct electrical properties. These properties include increased conductance, reduced impedance and resistance, increased capacitance, and elevated electrical potential compared to adjacent nonacupuncture points. Commercial electrodiagnostic devices have used this assertion as a means to localize and analyze acupuncture points for diagnostic purposes. Yet, the electrical characterization of acupuncture points is associated with important technical issues that are often overlooked. Electrode polarizability, stratum corneum impedance, presence of sweat glands, choice of contact medium, electrode geometry, and other factors contribute to the final electrodermal reading and may cause doubts about the validity of available electrodiagnostic devices. The goal of this review is to help researchers and clinicians understand these factors affecting electrodermal readings, to make apparent the difficulties and challenges confronting electrodermal readings, and to increase understanding about how these possible associations can be interpreted and understood from the perspective of biology. Ahn AC, Wu J, Badger GJ, Hammerschlag R, Langevin HM. Electrical impedance along connective tissue planes associated with acupuncture meridians. BMC Complementary and Alternative Medicine 2005; 5(1):10-19. Ultrasound of the pericardium meridian reveals that contact of the needle with connective tissue may explain the decrease in electrical impedance along the pericardium channel. Abstract: BACKGROUND: Acupuncture points and meridians are commonly believed to possess unique electrical properties. The experimental support for this claim is limited given the technical and methodological shortcomings of prior studies. Recent studies indicate a correspondence between acupuncture meridians and connective tissue planes. We hypothesized that segments of acupuncture meridians that are associated with loose connective tissue planes (between muscles or between muscle and bone) visible by ultrasound have greater electrical conductance (less electrical impedance) than non-meridian, parallel control segments. METHODS: We used a four-electrode method to measure the electrical impedance along segments of the Pericardium and Spleen meridians and corresponding parallel control segments in 23 human subjects. Meridian segments were determined by palpation and proportional measurements. Connective tissue planes underlying those segments were imaged with an ultrasound scanner. Along each meridian segment, four gold-plated needles were inserted along a straight line and used as electrodes. A parallel series of four control needles were placed 0.8 cm medial to the meridian needles. For each set of four needles, a 3.3 kHz alternating (AC) constant amplitude current was introduced at three different amplitudes (20, 40, and 80 microAmps) to the outer two needles, while the voltage was measured between the inner two needles. Tissue impedance between the two inner needles was calculated based on Ohm's law (ratio of voltage to current intensity). RESULTS: At the Pericardium location, mean tissue impedance was significantly lower at meridian segments (70.4 +/- 5.7 Omega) compared with control segments (75.0 +/- 5.9 Omega) (p = 0.0003). At the Spleen location, mean impedance for meridian (67.8 +/- 6.8 Omega) and control segments (68.5 +/- 7.5 Omega) were not significantly different (p = 0.70). CONCLUSION: Tissue impedance was on average lower along the Pericardium meridian, but not along the Spleen meridian, compared with their respective controls. Ultrasound imaging of meridian and control segments suggested that contact of the needle with connective tissue may explain the decrease in electrical impedance noted at the Pericardium meridian. Further studies are needed to determine whether tissue impedance is lower in (1) connective tissue in general compared with muscle and (2) meridian-associated vs. non meridian-associated connective tissue. Skin impedance measurements were taken at low frequencies (under 20 Hz) and at high frequencies (over 500 Hz). "A good choice for measuring frequency could be somewhere between 20 and 200 Hz, probably 100 Hz for a good noise rejection." Abstract: Comparative total impedance measurements for normal skin and acupuncture points are presented. The behavior of the impedance and admittance with the frequency for active points and indifferent skin is analyzed. It is indicated the optimum frequency domain for the detection of the acupuncture points. Becker RO, Reichmanis M, Marino AA, Spadaro JA. Electrophysiological correlates of acupuncture points and meridians. Psychoenergetic Systems 1976; 1:105-12. Comment by Steven J. Pollini: "Becker, et al. not only describes the electrical nature of these points and meridians, but has also laid a fine theoretical framework in which the phenomenon of acupuncture can be studied." Abstract: Electrical correlates have been established for a portion of the acupuncture system and indicate that it does have an objective basis in reality. Thus far, the data are supportive to the theory of the action of the acupuncture technique as influencing a primitive data transmission and control system. Conclusions: Electrical correlates have been established for a portion of the acupuncture system and indicate that it does have an objective basis in reality. Thus far, the data are supportive to our general theory of the action of the acupuncture technique in influencing a primitive data transmission and control system. Chizmadzhev Y, Indenbom A, Kuzmin P, Galichenko S, Weaver J, Potts R. Electrical properties of skin at moderate voltages: contribution of appendageal macropores. Biophysical Journal 1998; 74: 843-56. The purpose of this article was to prove that the skin resistance changes that happen through electroacupuncture can be attributed to electroporation of the appendageal ducts and to prove that electroporation of stratum corneum, specifically of the appendageal ducts, create a significant drop in skin resistance. This information is valuable to the medical community because skin has a barrier which does not allow substances to naturally flow through. If electroporation is used, then substances could more easily permeate the skin. Abstract: The electrical properties of human skin in the range of the applied voltages between 0.2 and 60 V are modeled theoretically and measured experimentally. Two parallel electric current pathways are considered: one crossing lipidcorneocyte matrix and the other going through skin appendages. The appendageal ducts are modeled as long tubes with distributed electrical parameters. For both transport systems, equations taking into account the electroporation of lipid lamella in the case the lipid-corneocyte matrix or the walls of the appendageal ducts in the case of the skin appendages are derived. Numerical solutions of these nonlinear equations are compared with published data and the results of our own experiments. The current-time response of the skin during the application of rectangular pulses of different voltage amplitudes show a profound similarity with the same characteristics in model and plasma membrane electroporation. A comparison of the theory and the experiment shows that a significant (up to three orders of magnitude) drop of skin resistance due to electrotreatment can be explained by electroporation of different substructures of stratum corneum. At relatively low voltages (U < 30 V) this drop of skin resistance can be attributed to electroporation of the appendageal ducts. At higher voltages (U >30 V), electroporation of the lipid-corneocyte matrix leads to an additional drop of skin resistance. These theoretical findings are in a good agreement with the experimental results and literature data. Cho S, Chun S. The basal electrical skin resistance of acupuncture points in normal subjects. Yonsei Medical Journal 1994: 35 (4) 464-74. The goal was to find out if basal skin resistance (BSR) changes when a person is in pain. Because there are so many variables to skin resistance?measurement values during previous studies were thought to be inconsistent, so the authors came up with a plan to obtain a "normal BSR map" by measuring multiple sites simultaneously and see if there are any useful measuring points among the 16 used. Abstract: The inhibitory component of the skin against given electrical current, also called as the electrical skin resistance, is subject to change in response to many factors, especially pain. In order to find out more definite relationship(s) between pain and skin resistance, one should make measurement in the state devoid of any external disturbing stimuli to get the "basal skin resistance (BSR)", which is known to be different from point to point on body surface. Also, the "active points" have more consistent BSR characters than other points and most of them share same locations with "acupuncture points" which is easy to localize accurately and repeatedly in normal subject. Therefore, the comparison of BSR of certain acupuncture points of normal subject and pain-suffering subjects is expected to be able to figure out any pain-induced BSR changes. Our measurement at 16 acupuncture points (asymmetrical 8 pairs) of 10 normal subjects showed inconsistently asymmetrical distribution of the BSR values with significant order among themselves including left SP (spleen)-6 at their lowest position, but neither the measuring system itself nor any of the 16 points was statistically reliable enough for diagnostic purposes. So the measuring device needs to be improved with after evolution, and more acupuncture points need to be explored to complete our pain-related BSR map. In addition, the meaning of the above BSR distribution pattern is waiting to be explained through such efforts. Hyvarinen J, Karlsson M. Low-resistance skin points that may coincide with acupuncture loci. Medical Biology 1977; 55(2): 88-94. Skin surface areas were tested for lower electrical resistance. The diameters of the lower resistance areas found were 1.5 +/- 0.5 mm, they were symmetrical, and the distribution of points on the hands, face and ears resembled that of classical acupuncture points. Abstract: Electrical resistance of skin was studied with the aid of a specially designed meter that compared the resistance per surface area of small skin points with that of the surrounding skin. In a systematic study of the hands, face and ears in five subjects low-resistance skin points were repeatedly found in characteristic loci, comparable in different individuals and symmetric about the body midline. The low-resistance skin points had diametres of 1.5 +/- 0.5 mm and their borders were abrupt. On the dry skin resistance values were around 10 kilo-ohms at the center of the points but around 3 mega-ohms in the surrounding skin. Voltages could also be recorded at these points, but they proved to be result of electrode polarization reflected at these points because of their low electrical resistance. The distribution of the low points in the hands, face and ears resembled that of classical acupuncture points. Jabouek B., Rohlicek V. Changes of electrodermal properties in the acupuncture points in men and rats. Physiologia Bohemoslovaca 1982; 31:143-49. Areas of increased skin conductivity (AISC) have been found at "so-called" acupuncture points. In this study skin conductance measurements were performed on both humans and rats. In humans AISC's can also be found in referred areas of pain. Abstract: The measurements of skin resistance to electrical current performed in rats and men indicated the occurrence of small skin areas, in which the conductivity for DC and AC was sharply increased. In healthy men, the anatomical localization of these areas of increased skin conductivity (AISC) corresponded to the localization of the so-called "acupuncture points" (AP). In patients, the AISC were also found outside the ordinary AP, mainly in areas of referred pain. The measurements of the size of AISC by multiple electrodes indicated the approximate size of AISC cca 350 microM in the rat, ccs 450 microns in man. The recording of skin conductivity were taken from : a) AISC in man and the rat, b) skin in the close neighbourhood of AISC, c) from the sweating human skin. Johng HM, Cho JH, Shin HS. Frequency dependence of impedances at the acupuncture point Quze (PC3). IEEE Engineering in Medicine and Biology 2002; 21:33-36. Pericardium 3 was measured, using a four electrode method; results were then compared to previous published studies, which did not use the four electrode method, in relation to impedance, resistance, and capacitance. Abstract: Pericardium (PC) 3 was measured, using a four electrode method, along with nearby control points. They found that the impedance of PC 3 is about 20% lower than control points. Results were then compared with other published studies that were done with regard to PC 3. It is not straightforward to compare skin-impedance data of various research groups because the impedance depends on so many variable factors, but "considering their method and location of measured skin are quite different from ours, we consider our results to be in reasonable agreement with theirs." Findings showed that the response times of the meridian and the control points are similar while the impedance, resistance and capacitance are quite different. Therefore, it is hypothesized that the response time represents some basic physiological process, while impedance, resistance, and capacitance reflect an individual's constitution. Kawakita K, Kawamura H, Keino H, Hongo T, Kitakohji H. Development of low impedance points on the auricular skin of experimental peritonitis rats. American Journal of Chinese Medicine 1991; 19:199-205. Low impedance points were discovered in the ears of rats with peritonitis which opens the possibility that sweats glands are not a major cause for the formation of low impedance points. A previous study determined that rats do not have sweat glands. Abstract: Electrical impedance of the auricular skin was measured in experimental peritonitis rats. Constant voltage pulses (10ms, 4V) were applied to the skin, then the impedance was estimated. Low impedance points were gradually increased after the operation for 7-14 days, then they returned to the control level. The pseudo-sweating responses accompanied by the development of peritonitis were also observed. Histological study could not find any sweat glands in the auricular skin. These results suggest that the activation of the sweat glands is not the major cause of the formation of the low impedance points. Other possibilities of these phenomena were discussed. Kwok G, Cohen M, Cosic I. Mapping acupuncture points using multi channel device. Australasian Physical & Engineering Sciences in Medicine 1998; 21(2):68-72. Because single point locator devices have limitations, a mutlti-probe measuring device was created which measures the resistance of multiple points with a single application of the electrode. Abstract: The practice of acupuncture involves the stimulation of specific points on the skin called 'acupuncture points' which are small regions of local or referred pain that are more sensitive than surrounding tissue. The fact that acupuncture points can be identified subjectively as tender points and are found to have characteristic electrical properties suggest that they are functional entities rather than structural ones. These functional properties are used diagnostically in a clinical setting as pathology in a particular body location has been shown to correlate with increased tenderness and electrical conductivity of the 'corresponding' acupuncture point using electronic 'point locators', which measure the DC resistance of points compared to surrounding skin. Commercially available point locators generally utilize a metal locator probe and an indifferent electrode and are designed to produce an auditory output (usually a high pitched tone) when a point is located. These devices however, are open to criticism. They are unable to control for local variations in skin thickness, surface secretions, or pressure placed on the electrode, and are only able to measure a single point at a time. These make them time consuming to use and subjective to user bias in point selection. Furthermore these devices do not store data and are therefore unsuitable for producing a map of skin resistance, which can be accessed over time. To overcome some of the limitations of currently available single probe devices, we have designed a multi-channel probe capable of measuring and then mapping the skin resistance of multiple points. Motoyama H. Measurements of ki energy: diagnoses and treatments. Tokyo: Human Science Press, 1977. Treatment principles of Oriental Medicine from an Electrophysiological viewpoint. Abstract: Book Review: "This book is a modern classic in the scientific study of Ki (vital energy) within the context of the organ/meridian system of the human body. It is the result of several years of intensive study, during which Dr. Motoyama made constant improvements in his famous AMI device for measuring Ki, both physically and physiologically. This book embodies great technical expertise, immense wisdom and boundless compassion. It represents another vital step forward in our efforts to achieve "health for all". It is essential reading for every serious student of Oriental medicine which - like the work of Dr. Hiroshi Motoyama - has so substantially withstood the test of time." Ogata HT, Matsumoto T, Tsukahara H. Changes in the electrical skin resistance on meridians during gastric surgery under general anesthesia. American Journal of Chinese Medicine 1983; 11(1-4):123-29. During gastric surgery, with general anesthesia, skin resistance decreased by an average of 36 percent in all meridians except the kidney and bladder, which increased by 100 percent and 73 percent, respectively. Abstract: The purpose of this experiment was to investigate how the skin resistance on accumulation points is modified by general anesthesia in gastric surgery and whether the stomach meridian shows particular changes or not. Ten patients were inducted with 5 mg/kg of thiopental and maintained with nitrous oxide-oxygen-halothane. The skin resistance on 12 meridians decreased gradually from an average of 432 KΩ before anesthesia to an average of 266 KΩ at the end of surgery. However, the kidney and the bladder meridians showed a trend to exceptional increase by a maximum of 100 and 73 percent, respectively. The skin resistance on the stomach meridian showed only a 23 percent decrease and no particular changes. No significant difference was noted in the change rate of meridians between the Yin and Yang groups. Comparison of these changes with those under acupuncture or local anesthesia during ophthalmic surgery was discussed. Ogata HT, Matsumoto T, Tsukahara H. Electrical skin resistance changes in meridians during ophthalmic surgery with local anesthesia. American Journal of Chinese Medicine 1983; 11(1-4):130-36. Accumulation points were measured during ophthalmic surgeries using local anesthesia and acupuncture anesthesia. The differences of pain, sympathetic nervous activity, and skin resistance between local and acupuncture anesthesia showed that pain may induce hyperactivity of the sympathetic nervous system and result in a decrease of the skin resistance in acupuncture anesthesia. Painlessness, on the other hand, may induce hypoactivity of the sympathetic nervous system and result in an increase of the skin resistance. Abstract: Electrical skin resistance on accumulation points in twelve meridians was measured during operation of cataract under local anesthesia. Electrical skin resistance increased an average of 15 percent in bladder, kidney, liver, stomach, gall bladder meridians, and decreased an average of 18 percent in lung, small intestine, heart, spleen-pancreas, heart constrictor, triple heater, large intestine meridians. When comparing the skin resistance values with those under acupuncture anesthesia during ophthalmic surgery, the skin resistance value under acupuncture anesthesia exhibited a marked decrease in all meridians (average 23 percent decrease) except the kidney meridian. On the other hand, the skin resistance under local anesthesia was only a 7.4 percent decrease in all meridians except the kidney meridian. It was speculated as one of the reasons for less changes of skin resistance under local anesthesia that sympathetic nervous activity did not occur so much because of pain relief due to local anesthesia. Prokhorov EF, Prokhorova TE, Gonzalez-Hernandez J, Kovalenko YA, Llamas F, Moctezuma S, Romero H. In vivo DC and AC measurement at acupuncture points in healthy and unhealthy people. Complementary Therapies in Medicine 2006; 14(1):31-38. Comparison of direct current and alternating current in acupuncture points from subjects living in different geological locations. Abstract: OBJECTIVES: The aim of this work was to compare in vivo measurements of direct current (DC) and alternating current (AC) obtained from acupuncture points in Ukrainian and Mexican residents. RESULTS: The results showed that DC measurements are not directly applicable to different populations. Thus, the DC resistance of the acupuncture points in the Mexican participants was 4-5 times larger than in the Ukrainians. In contrast, the capacitance of the two groups did not differ by more than 25%. CONCLUSIONS: Impedance measurements from acupuncture points can be used as an efficient and prompt non-invasive method for diagnostic purposes. Reichmanis M, Marino AA, Becker RO. D.C. skin conductance variation at acupuncture loci. American Journal of Chinese Medicine 1976; 4(1):69-72. A 36-electrode grid was placed over acupuncture locations and each were measured to show that conductance of acupuncture points were significantly different than non-acupuncture points. Abstract: Skin conductance was measured in 10 subjects with a DC Wheatstone bridge in 10 areas purportedly containing acupuncture loci on the Triple Burner (TB) and Lung (Lu) meridians. When the results were compared to those from anatomically similar locations devoid of acupuncture loci, local conductance variation was found to be significantly different (p less than 0.05) in most acupuncture locus locations. Reichmanis M, Marino AA, Becker RO. Electrical correlates of acupuncture points. IEEE Transactions on Biomedical Engineering 1975; 22(6):533-35. Conductance was measured between the Large Intestine and Pericardium meridians of the lower arm and compared to similar anatomical structures within the body to compare electrical resistance measurements. Abstract: Employing a Wheatstone bridge, skin conductance was measured over those putative acupuncture points on the large intestine and pericardium meridians lying between the metacarpophalangeal points and the elbow. Results were compared to those from anatomically similar locations devoid of acupuncture points. At most acupuncture points on most subjects, there were great electrical conductance maxima than at control sites. Conclusion: It was found that most points on the pericardium and large intestine meridians, as defined and described by the standard charts, are points of local electrical conductance maxima on most subjects. These points, therefore have an objective existence in most subjects. Reichmanis M, Marino AA, Becker RO. Laplace plane analysis of impedance between acupuncture points H-3 and H-4. Comparative Medicine East and West 1977; 5(3-4):289-9. "It appears likely that AC impedance as well as the DC resistance of some acupuncture points is significantly different from that of other points on the skin and tend to support our interpretation of the classical acupuncture system as a network for information transmission." Abstract: The frequency dependence of the skin impedance between two acupuncture points (H-3 and H-4) was determined by Laplace plane analysis of the time domain response to an input voltage perturbation. Both the resistance and capacitance between the acupuncture points differed significantly from the corresponding controls, thus supporting the interpretation of the acupuncture system as an information transfer network. Starwynn D. Electrophysiology and the acupuncture systems. Medical Acupuncture 2002; 13(1). A summary of the history and research relating to electromagnetics and living systems with a focus on understanding acupuncture needling, meridians, life-force, and acupoints from the perspective of bioelectromagnetism. Abstract: There have been extensive efforts in recent decades to correlate the principles of Traditional Chinese Medicine (TCM) with Western medical science. The most promising bridge between these 2 paradigms has been in the field of bioelectromagnetism (BEM), the study of the subtle electromagnetic fields that are the underpinning of life processes. Most of the significant research in this field comes from Europe, and much of it has not been readily available in the United States. This article is an overview of research in this field, with a focus on understanding acupuncture needling, meridians, life-force, and acupoints from the perspective of BEM. Wu B, Hu X, Xu J. Effect of increase and decrease of measurement voltage on skin impedance. Zhen Ci Yan Jui 1993; 18(2):104-7. Points on the body with high skin impedance cannot be changed into low skin impedance points by increasing voltage. Abstract: The skin impedance has been used as an index to plot out the meridian courses. In most of this kind of methods during measurement voltage was necessary to deliver to the subject's skin. It is unknown whether increasing the measuring voltage can change non-low skin impedance points (non-LSIP) into low skin impedance points (LSIP). In order to clarify the problem, we made an investigation on the effect of increasing and decreasing the measuring voltage on skin impedance. Subjects under observation were 12 healthy volunteers. On the medial side of forearm two levels were selected for measurement. Four or twenty non-LISP were observed on each level. The measuring system worked on the basis of bioelectrode method. The measurement and data processing were controlled by microcomputer. During measurement impedance of LSIP decreased correspondingly with the increase of voltage and vice versa, but the value of impedance was not exceeded 100kΩ in spite of increasing or decreasing the voltage. That is, low impedance is the inherent characteristics of LSIP. On the contrary, the impedance of non-LSIP remained in higher than 600kΩ in most of cases during increasing voltage from 10 to 50v. As the voltage increased to 65v, the impedance in a part of non-LSIP decreased to such a low level as LSIP. However, their impedance increased rapidly to high level again once the measuring voltage decreased. The above results reveal that the response of non-LSIPs and LSIPs were different from each other in nature. Increasing the voltage could not change a non-LSIP into LSIP. Xiang ZZ, Ming XR, Gou XJ, Zhuang YS. Experimental meridian line of stomach and its low impedance nature. Acupunct Electrother Res 1984; 9 (3):157-64. Because of electrical impulse stimulation which was created at Stomach 45, patients were able to feel a sensation along the classical stomach channel. Skin impedance along the area of sensation was lower than adjacent areas. Abstract: Applying electrical impulse stimuli at the Jing point (St. 45) and then tapping on the skin surface along the vertical lines crossing the channel of the stomach, the line of latent propagated sensation along channel (LPSC) was determined in 51 patients at the acupuncture clinic. Of the cases examined, 98 percent were found to have positive LPSC lines which were basically coincident with the classical stomach channel. Using a low frequency skin impedance detector, the skin impedance of the entire lines of LPSC was found to be lower than its adjacent areas. Zhang W, Xu R, Zhu Z. The influence of acupuncture on the impedance measured by four electrodes on meridians. Acupunct Electrother Res 1999; 24(3-4):181-88. Interstitial fluid and blood capillary expansion may be one of the mechanisms of acupuncture regulation. Abstract: The impedance on the pericardium merdian near Quze (P3) and control points in 12 cases was measured by a four electrodes impedance instrument. The amplitude of impedance was recorded before, during and after needling the Neiguan. The result showed that the mean impedance on the meridian and control points before the needling were 52.8 +/- 11.0 (Ω) and 61.7 +/- 10.3 (Ω) respectively which had significant difference (P<0.05). During the needling, impedance decreased significantly on the meridian by 9.2 +/- 5.6 (Ω) (P<0.001) while impedance decreased by only 0.12 +/- 2.4 (Ω) on control points without significance (P>0.05). The impedance changed back to 51.1 +/- 11.3 (Ω) and 59.9 +/- 11.0 (Ω) on the meridian and control points respectively during the 5-10 minutes after withdrawing the needling. In some cases, impedance changed intermittently during the needling. The experiment implies that interstitial fluid increases during the needling by axon reflection and blood capillary expanding which may be one of the mechanisms of acupuncture regulation. Ahn AC, Park M, Shaw JR, McManus CA, Kaptchuk TJ, Langevin HM. Electrical impedance of acupuncture meridians: the relevance of subcutaneous collagenous bands. PloS ONE 2010; 5(7): e11907. Because acupuncture meridians and points have been found to overlie fascial planes between muscles, a study was developed to analyze whether echogenic collagenous bands, which are represented by increased ultrasound echnogenicity, can account for impedance differences. Abstract: BACKGROUND: The scientific basis for acupuncture meridians is unknown. Past studies have suggested that acupuncture meridians are physiologically characterized by low electrical impedance and anatomically associated with connective tissue planes. We are interested in seeing whether acupuncture meridians are associated with lower electrical impedance and whether ultrasound-derived measures - specifically echogenic collagenous bands - can account for these impedance differences. METHODS/RESULTS: In 28 healthy subjects, we assessed electrical impedance of skin and underlying subcutaneous connective tissue using a four needle-electrode approach. The impedances were obtained at 10 kHz and 100 kHz frequencies and at three body sites - upper arm (Large Intestine meridian), thigh (Liver), and lower leg (Bladder). Meridian locations were determined by acupuncturists. Ultrasound images were obtained to characterize the anatomical features at each measured site. We found significantly reduced electrical impedance at the Large Intestine meridian compared to adjacent control for both frequencies. No significant decrease in impedance was found at the Liver or Bladder meridian. Greater subcutaneous echogenic densities were significantly associated with reduced impedances in both within-site (meridian vs. adjacent control) and between-site (arm vs. thigh vs. lower leg) analyses. This relationship remained significant in multivariable analyses which also accounted for gender, needle penetration depth, subcutaneous layer thickness, and other ultrasound derived measures. CONCLUSION/SIGNIFICANCE: Collagenous bands, represented by increased ultrasound echogenicity, are significantly associated with lower electrical impedance and may account for reduced impedances previously reported at acupuncture meridians. This finding may provide important insights into the nature of acupuncture meridians and the relevance of collagen in bioelectrical measurements. Bai Y, Wang J, Wu JP, Dai JX, Sha O, Yew DTW, Yuan L, Liang Q. Review of evidence suggesting that the fascia network could be the anatomical basis for acupoints and meridians in the human body. Evidence-Based Complementary and Alternative Medicine 2011; Article ID 260510. Evidence from various fields related to fascia anatomy and physiology were reviewed to determine that "the fascia network may be the anatomical basis for acupoints and meridians in the human body." Abstract: Review: The anatomical basis for the concept of meridians in traditional Chinese medicine (TCM) has not been resolved. This paper reviews the evidence supporting a relationship between acupuncture points/meridians and fascia. The reviewed evidence supports the view that the human body's fascia network may be the physical substrate represented by the meridians of TCM. Specifically, this hypothesis is supported by anatomical observations of body scan data demonstrating that the fascia network resembles the theoretical meridian system in salient ways, as well as physiological, histological, and clinical observations. This view represents a theoretical basis and means for applying modern biomedical research to examining TCM principles and therapies, and it favors a holistic approach to diagnosis and treatment. Langegin HM, Yandow JA. Relationship of acupuncture points and meridians to connective tissue planes. Anat Rec, Vol 269, pp. 257-265, 2002. This article links traditional Chinese acupuncture theory with conventional anatomy. It is hypothesized that network and acupuncture meridians can be linked to the interstitial connective tissue and that this relationship is relevant to the therapeutic mechanisms of acupuncture. Abstract: Acupuncture meridians traditionally are believed to constitute channels connecting the surface of the body to internal organs. We hypothesize that the network of acupuncture points and meridians can be viewed as a representation of the network formed by interstitial connective tissue. This hypothesis is supported by ultrasound images showing connective tissue cleavage planes at acupuncture points in normal human subjects. To test this hypothesis, we mapped acupuncture points in serial gross anatomical sections through the human arm. We found an 80% correspondence between the sites of acupuncture points and the location of intermuscular or intramuscular connective tissue planes in postmortem tissue sections. We propose that the anatomical relationship of acupuncture points and meridians to connective tissue planes is relevant to acupuncture?s mechanism of action and suggests a potentially important integrative role for interstitial connective tissue. Langevin HM, Bouffard NA, Badger GR, Churchill DL, Howe AC. Subcutaneous tissue fibroblast cytoskeletal remodeling induced by acupuncture: evidence for a mechanotransduction-based mechanism. Journal of Cellular Physiology 2006; 207(3):767-74. Rotation of acupuncture needles induce an active cytoskeletal response in connective tissue fibroblasts—an important step in understanding cellular mechanotransduction responses to externally applied mechanical forces in whole connective tissue. Abstract: Acupuncture needle rotation has been previously shown to cause specific mechanical stimulation of subcutaneous connective tissue. This study uses acupuncture to investigate the role of mechanotransduction-based mechanisms in mechanically-induced cytoskeletal remodeling. The effect of acupuncture needle rotation was quantified by morphometric analysis of mouse tissue explants imaged with confocal microscopy. Needle rotation induced extensive fibroblast spreading and lamellipodia formation within 30 min, measurable as an increased in cell body cross sectional area. The effect of rotation peaked with two needle revolutions and decreased with further increases in rotation. Significant effects of rotation were present throughout the tissue, indicating the presence of a response extending laterally over several centimeters. The effect of rotation with two needle revolutions was prevented by pharmacological inhibitors of actomyosin contractility (blebbistatin), Rho kinase (Y-27632 and H-1152), and Rac signaling. The active cytoskeletal response of fibroblasts demonstrated in this study constitutes an important step in understanding cellular mechanotransduction responses to externally applied mechanical stimuli in whole tissue, and supports a previously proposed model for the mechanism of acupuncture involving connective tissue mechanotransduction. Langevin HM, Churchill DL, Wu J, Badger GJ, Yandow JA, Fox JR, Krag MH. Evidence of connective tissue involvement in acupuncture. FASEB Journal 2002; 16(8):872-74. The goal of this study was to determine whether muscle or subcutaneous tissue is responsible for needle grasp. Abstract: Acupuncture needle manipulation gives rise to "needle grasp," a biomechanical phenomenon characterized by an increase in the force necessary to pull the needle out of the tissue (pullout force). This study investigates the hypothesis that winding of connective tissue, rather than muscle contraction, is the mechanism responsible for needle grasp. We performed 1) measurements of pullout force in humans with and without needle penetration of muscle; 2) measurements of pullout force in anesthetized rats, with and without needle rotation, followed by measurements of connective tissue volume surrounding the needle; 3) imaging of rat abdominal wall explants, with and without needle rotation, using ultrasound scanning acoustic microscopy. We found 1) no evidence that increased penetration of muscle results in greater pullout force than increased penetration of subcutaneous tissue; 2) that both pullout force and subcutaneous tissue volume were increased by needle rotation; 3) that increased periodic architectural order was present in subcutaneous tissue with rotation, compared with no rotation. These data support connective tissue winding as the mechanism responsible for the increase in pullout force induced by needle rotation. Winding may allow needle movements to deliver a mechanical signal into the tissue and may be key to acupuncture's therapeutic mechanism. Langevin HM, Yandow JA. Relationship of acupuncture points and meridians to connective tissue planes. The Anatomical Record 2002; 269(6):257-65. "Findings suggest that the location of acupuncture points, determined empirically by the ancient Chinese, was based on palpitation of discrete locations or 'holes' where the needle can access greater amounts of connective tissue." Abstract: Acupuncture meridians traditionally are believed to constitute channels connecting the surface of the body to internal organs. We hypothesize that the network of acupuncture points and meridians can be viewed as a representation of the network formed by interstitial connective tissue. This hypothesis is supported by ultrasound images showing connective tissue cleavage planes at acupuncture points in normal human subjects. To test this hypothesis, we mapped acupuncture points in serial gross anatomical sections through the human arm. We found an 80% correspondence between the sites of acupuncture points and the location of intermuscular or intramuscular connective tissue planes in postmortem tissue sections. We propose that the anatomical relationship of acupuncture points and meridians to connective tissue planes is relevant to acupuncture's mechanism of action and suggests a potentially important integrative role for interstitial connective tissue. Colbert A, Yun J, Larsen A, Edinger T, Gregory W, Thong T. Skin impedance measurements for acupuncture research: development of a continuous recording system. eCam 2008: 5 (4) 443-450. The more objective and quantifiable the outcome measure used in acupuncture research, the more credible that research becomes. The purpose of this project was to develop and pretest a single channel system (the prototype for a future multi-channel system) that would accurately and reliably record a wide range of skin impedance, resistance and capitance continuously for up to 1 hour. Abstract: Review: Skin impedance at acupuncture points (APs) has been used as a diagnostic/therapeutic aid for more than 50 years. Currently, researchers are evaluating the electrophysiologic properties of APs as a possible means of understanding acupuncture?s mechanism. To comprehensively assess the diagnostic, therapeutic and mechanistic implications of acupuncture point skin impedance, a device capable of reliably recording impedances from 100 k to 50M at multiple APs over extended time periods is needed. This article describes design considerations, development and testing of a single channel skin impedance system (hardware, control software and customized electrodes). The system was tested for accuracy against known resistors and capacitors. Two electrodes (the AMI and the ORI) were compared for reliability of recording over 30 min. Two APs (LU 9 and PC 6) and a nearby non-AP site were measured simultaneously in four individuals for 60 min. Our measurement system performed accurately (within 5%) against known resistors (580 k-10M) and capacitors (10 nF-150 nF). Both the AMI electrode and the modified ORI electrode recorded skin impedance reliably on the volar surface of the forearm (r 1/4 0.87 and r 1/4 0.79, respectively). In four of four volunteers tested, skin impedance at LU 9 was less than at the nearby non-AP site. In three of four volunteers skin impedance was less at PC 6 than at the nearby non-AP site. We conclude that our system is a suitable device upon which we can develop a fully automated multi-channel device capable of recording skin impedance at multiple APs simultaneously over 24 h.
Colbert AP, Hammerschlag R, Aikin M, NcNames J. Reliability of the prognos electrodermal device for measurements of electrical skin resistance at acupuncture points. The Journal of Alternative and Complementary Medicine 2004; 10(4):610-16. The Prognos resistance detector was tested for accuracy and reliability in testing Jing-well acupuncture points. "We concluded that the electrical resistance measurements at the 24-Jing-well acupuncture points, when measured with the Prognos, can be regarded as sufficiently reliable in a biomedical research setting." Abstract: OBJECTIVES: (1) To characterize and calibrate an electrodermal screening device, Prognos. (2) To replicate a previous test-retest reliability study of this device with measurements of electrical skin resistance (ESR) at 24 Jing-well acupuncture points (APs). (3) To determine measurement precision in three successively more exacting trial protocols on the same set of subjects. CONCLUSIONS: Prognos performs accurately, against known resistors over the reported range of ESR. The reliability in the standard protocol (r = 0.758) is comparable to the reliability of 0.721 demonstrated under similar conditions by other investigators. Marking APs, and performing measurements in a rapid sequence, increases reliability of ESR measurements. Increased reliability in the second and third protocols is associated with decreased mean ESR values which may be related to increased accuracy of Prognos probe placement and/or inking the APs. Eickhorn R, Schimmel H. Electrophysiological diagnosis at terminal points of acupuncture meridians. Biomedical Therapy 1999: 13 (3) 111-13. "The present study is concerned with the basis of endogenous potentials and currents at terminal points of meridians and with recording them in a replicable manner." Abstract: Small electrical potentials can be recorded on the skin at the terminal points of acupuncture meridians; the results are replicable under controlled experimental conditions. In an experimental group of 10 subjectively healthy subjects, these potentials average 16 +/- 17 mV(SD). As a result of these potentials, the current produced ranges from a few to several hundred nanoamperes, which can be recorded by an external measuring device. This method of detecting electrical current is different from using an external voltage source in the measurement of conductance. For this reason, it is especially useful for diagnostic electroacupuncture. Hu X, Wu B, Xu J, Hao J. Studies on the low skin impedance points and the feature of its distribution along the channels by microcomputer: observation on the reliability of the measurement. Zhen Ci Yan Jui 1990; 15(3):232-8. The comparison of low skin impedance points and non-low skin impedance points in the surrounding area show the difference to be "highly significant"—leaving a prerequisite for further observation. Abstract: According to the requirement of channel research, a system for the measurement of skin impedance had been designed and a series of experiments to check the reliability of this system had also been done. The facts demonstrated that the pressure exerted by the exploring electrode, the duration of switch-on as well as the number of times of repeated measurements all showed no conspicuous influences on the skin impedance. The results are stable and reliable. Moreover, the measurement and data processing are controlled by microcomputer. Thus, the method of measurement of skin impedance along the channels has been developed to a higher level. Under the conditions of our experiment, the impedance of the low skin impedance points (LSIPs) are about 108k omega, which are quite low than that of the non-LSIPs around them. The difference between the two is highly significant. Both the impedance of LSIPs and non-LSIPs are stable, without marked variation. These results provide the prerequisites indispensable for the further observation on the feature of the distribution of LSIPs. Huang X, Xu J, Wu B, Hu X. Observation on the distribution of LSIPs along three yang meridians as well as ren and du meridians. Zhen Co Yan Jui 1993; 18(2):98-103. Low skin impedance was measured and confirmed along the three yang meridians of the foot (Urinary Bladder, Gallbladder, and Stomach) along with the Ren and Du meridians. Significant low skin impedance points were found directly on the point locations and within 5 mm bilaterally to their location. Abstract: The results of our previous works demonstrated that the low skin impedance points (LSIPs) basically distributed along the meridian courses. In order to further clarify what extent LSIPs distributed along the meridians and the feature of distribution of LSIPs in different part of the body, the Three Yang Meridians of Foot as well as Ren and Du Meridians were studied in this work once again. Twenty five volunteers were under observation. As known to all, the Three Yang Meridians of Foot, which travel over several body regions, are the longest three with most complicated courses, among the Twelve Normal Meridians. Ren and Du meridians, which travel along the anterior and posterior median line of the trunk respectively, are the representative of the Eight Extra Meridians. Regardless of their particular travelling courses, the overwhelming majority of LSIPs located right on or within 5 mm bilaterally to their courses. It could be found in non-meridian area only in a few cases. The results of observation on the back is especially to be noticed. Evidently, LSIPs appeared randomly when the exploring electrode moved forward from one side of the back, crossed 5 meridians in succession, to another side. Even so, viewing the situation as a whole, LSIPs still concentrated along 5 bands, basically coincided with the course of Du Meridian and Three Yang Meridians of Foot. The results further confirmed that LSIPs really distributed along the meridian courses in the main. Litscher G, Wang L. Biomedical engineering meets AP--development of a miniaturized 48-channel skin impedance measurement system for needle and laser AP. Biomed Eng Online. 2010 Nov 23;9:78. A study to explore a new way of measuring galvanic skin response at an acupuncture point in real time. Abstract: Abstract: Due to controversially discussed results in scientific literature concerning changes of electrical skin impedance before and during AP a new measurement system has been developed. Methods: The prototype measures and analyzes the electrical skin impedance computer-based and simultaneously in 48 channels within a 2.5x3.5 cm matrix. Preliminary measurements in one person were performed using metal needle and violet laser (405 nm) AP at the AP Pt Kongzui (LU6). The new system is an improvement on devices previously developed by other researchers for this purpose. ? Results: Skin impedance in the immediate surroundings of the AP Pt was lowered reproducibly following needle stimulation and also violet laser stimulation. Conclusions: A new instrumentation for skin impedance measurements is presented. The following hypotheses suggested by our results will have to be tested in further studies: Needle AP causes significant, specific local changes of electrical skin impedance parameters. Optical stimulation (violet laser) at an AP Pt causes direct electrical biosignal changes. Lykken D, Venables P. Direct measurement of skin conductance: a proposal for standardization. Psychophysiology 1971: 8 (5) 656-72. "Our purpose in this paper is to describe in detail a method of measuring skin conductance which we would advocate for general use and to defend our claim that this method represents the current state of the art?It is feasible, and we think expedient to promote a provisional standardization by describing a method which could easily be followed by any investigator and which is so well based in current knowledge of electrodermal processes that someone choosing to depart from this method might feel some onus to justify that deviation." Abstract: A provisional standard method of measuring tonic skin conductance (SCL) and GSR (SCR) is advocated, using a constant-voltage method for which circuits are provided usable with Beckman, Grass, and other common polygraphs. A standard electrode methodology is also presented. The problem of units of measurement is considered in detail with an analysis of the so-called Law of Initial Values. Methods are given for correcting both tonic SC and SCRs for individual differences in their respective ranges of variation and the purpose and relative advantages of these range-correction methods are discussed. Ma YN, Yang HY, Chen JJ, Feng L, Li LG. Zhongguo Zhen Jiu. Analysis on resistance testing and technological research of AP Pts. [Article in Chinese] 2011 Dec;31(12):1087-91. A discussion of the correlation of electrical resistance of the skin and electrical resistance of acupuncture points. Abstract: In order to summarize and analyze the progresses and problems of resistance testing and technology research on AP Pts, investigate the related solutions, articles on resistance testing from 1990 to 2011 were collected, and advantages and shortcomings of different types of testing instruments were discussed in this article as well. Detection technology of AP Pt impedance has under updating changes, which are often applied on locating AP Pts and clinical Dx. The progresses of those technologies are mainly embodied in improvement of circuit model, which enable a longer testing duration, less media interference and so on. The previous studies often focus on resistance testing of the skin. Since dermal resistance does not equal to AP Pt resistance, the designation of equivalent circuit does not embody the condition of cells, tissues and nerves at AP Pts, and testing technology is often affected by factors such as polarization of electrodes, contact medium and anatomical characteristics of AP Pts, the resistance of AP Pts CANNOT be taken as the effective framework of the diagnostic standard and judgment of therapeutic effect in clinic. Based on the key problems in resistance testing of AP Pts, it is proposed by the article that the techniques and designation of circuit model should be reformed, and mathematical model should be established in the study to meet the requirement of the life system. Inductance of human body should be considered in resistance research of AP Pts, and interference factors should be eliminate as far as possible in designation of equipments. Thus, the change law of AP Pt resistance in the inner part of the body can be fully embodied by the designation of experiments. Mist S, Aickin M, Kalnins P, Cleaver J, Batchelor R, Thorne T, Chamberlin S, Tippens K, Colbert A. Reliability of acugraph system for measuring skin conductance at acupoints. Acupunct Med 2011: 29 (3) 221-6. The objectives of this study were to determine the accuracy of measurements obtained with the commercially available AcuGraph 3 Digital Meridian Imaging System; to evaluate the repeatability of test-retest measurements and to assess the interoperator agreement of skin conductance measurements at the Jing-Well and Yuan Source acupoints. Abstract: OBJECTIVE: There are many commercially available instruments for measuring electrical conductance, but there is little information about their reliability. The aim of this study was to quantify measurement variability and assess reliability of the AcuGraph system-a commonly used electrodermal screening device. METHODS: Four experiments were conducted to measure variability in electrical conductance readings obtained by the AcuGraph system. The first involved measuring known resistors. The second measured non-human organic matter. The third was a test-retest assessment of the Yuan-Source and Jing-Well points in 30 healthy volunteers who were measured by a single operator. The fourth was an interoperator reliability evaluation of seven acupuncturists at the Yuan-Source and Jing-Well acupoints on four individuals at two time points. RESULTS: Against known resistors, the AcuGraph had an average coefficient of variability (CV) of 1.8% between operators and test-retests. On non-human organic material the AcuGraph had an average CV of 0.9% and 2.8%. When a single operator tested 30 participants, the average reliability for the Yuan-Source points was 0.86 and 0.76 for Jing-Well points with a CV of 23.2% and 25.9% respectively. The average CV for the seven acupuncturists was 24.5% on Yuan-Source points and 23.7% on Jing-Well points. CONCLUSIONS: The AcuGraph measures known resistors and organic matter accurately and reliably. Skin conductance at acupoints recorded by one operator was also reliable. There was less consistency in electrodermal recordings obtained by seven different operators. Operator training and technical improvements to the AcuGraph may improve consistency among operators. She YF, Zhu J. Zhongguo Zhen Jiu. Analysis on the characteristics and interference factors of different types of measurement instruments for meridian-acupoint resistance. [Article in Chinese] 2012 Jul;32(7):661-4. This study delves into the efficacy of various types of measurement instruments for Acupoint resistance measurement. Abstract: The meridian-acupoint has response function and effect function. As a direct reflection between acupoint and diseased area, the response function is the foundation of the effect function, and skin resistance of acupoint is usually used as an objective index for research of meridian-acupoint response. Among the skin resistance-based researches on specificity of meridian-acupoint reaction, the selection of instrument is a key point. At present the main measurement instruments for meridian-acupoint resistance include dual-electrode device and four-electrode device. After analyzing the characteristics and interference factors of different types of measurement instruments for meridian-acupoint resistance, dual-electrode device is suitable for qualitative analysis, for its control of interference factors needs to improve. The four-electrode device is good at quantitative research, for it is easier to control interference factors. Yet, there is more for research department to do to improve the instrument design by modern scientific technique in order to meet need for research. Tiller W. On the explanation of electrodermal diagnostic and treatment instruments part 1. The electrical behavior of human skin. Journal of Holistic Medicine, 1982. A proposal for the next generation of diagnostic equipment to measure electrical responses on the skin which use all the information that is available in an electrical measurement. Abstract: Using basic information on the electrical properties and the response behavior of both macroscopic and microscopic (acupuncture points) areas of human skin, it has been possible to account for all the key characteristics of the three major electrical diagnostic instruments on the market; i.e., the Voll Dermatron instrument, the Motoyama AMI instrument, and the Schimmel Segment Electrograph instrument. None of these instruments use all the information that is available in an electrical measurement and the basis for a new class of measuring instrument, capable of revealing much more information, has been given. Ahn AC, et al. Electrodermal measures of jing-well points and their clinical relevance in endometriosis-related chronic pelvic pain. J Altern Complement Med 2009; 15(12):1293-305. A study to determine whether electrodermal measurements at Jing-Well points correlate with patients experiencing chronic pelvic pain. Abstract: OBJECTIVES: To determine whether electrodermal measures at Jing-Well acupuncture points, "indicator" points, located at the tips of fingers and toes are associated with clinical measures in adolescent women with chronic pelvic pain. RESULTS: Participants designated to the acupuncture group had, on average, a substantial decrease in statistical dispersion and asymmetry of Hibiki-7 values over the course of treatment compared to the sham group. Electrodermal asymmetry variables, specifically either yin-yang or left-right measure, were significantly associated with pelvic pain, Endometriosis Health Profile, Pediatric Quality of Life, and Perceived Stress even after adjusting for treatment designation. No associations between electrodermal balance measures and inflammatory cytokines were found. CONCLUSIONS: Electrodermal measures may be significantly associated with clinical outcome and acupuncture treatments in adolescent women with chronic pelvic pain. Chamberlin S, Colbert AP, Larsen A. Skin conductance at 24 Source (Yuan) acupoints in 8637 patients: influence of age, gender and time of day. J Acupunct Meridian Stud. 2011 Mar;4(1):14-23. More than 8500 patient exams were evaluated to determine if there is a correlation or typical effect on overall energetic meridian balance based on age, gender, and time of day. Abstract: The clinical practice of recording skin conductance (SC) at acupuncture points (acupoints), as a diagnostic and/or therapeutic monitoring aid may have scientific merit. However, influences of age, gender and time of day on these recordings are unknown and it is unclear whether SC at acupoints differs from SC levels in general (as reported in psychophysiology research). This paper summarizes SC data obtained with the AcuGraph 3 Digital Meridian Imaging System between June 2005 and March 31, 2010. An initial dataset of 117,725 SC examinations was scrubbed to include only the first SC examination on individual patients and exclude potentially faulty data. The final dataset consists of SC recordings at the 24 Source (Yuan) acupoints in 8637 patients, collected by 311 practitioners. 12 left/right average conductance measures and an overall average of the 24 acupoints were assessed. Statistical analyses included two sample t tests, three way analyses of variance and linear regression. Results indicate that mean SC at acupoints, similar to SC in general, is higher in males, higher in afternoons and declines with age. Not previously reported, the rate of SC decline with age differs at different acupoints between males and females. These findings have substantial implications for acupuncture research and practice. Colbert AP, Spaulding KP, Ahn AC, Cutro JA. Clinical utility of electrodermal activity at AP Pts: a narrative review. Acupunct Med. 2011 Dec;29(4):270-5. In-depth discussion of 7 well known studies on correlation of electro-dermal-response measurements with conditions of acupuncture meridians. Abstract: Objectives: To provide an in-depth analysis of seven well-reported studies that examined electrodermal activity (EDA) at AP Pts with regard to three commonly held tenets of AP: (1) EDA at pathology-related AP Pts is distinguishable from non-pathology-related AP Pts; (2) EDA at AP Pts can assist in diagnosing and monitoring therapeutic progress; and (3) EDA at AP Pts is able to identify substances that are either therapeutically beneficial or toxic to an individual. Methods: Seven of 29 studies that scored > 50% on their quality of reporting 54 essential technical and clinical details of EDA testing in human patients were identified from a previous literature review. Fourteen categories of data were extracted from these seven studies for further discussion. Results: Two studies compared EDA at pathology-related Ear AP Pts to non-pathology-related sites. Two studies correlated EDA measurements at sites other than Ear AP Pts with the presence of specific medical conditions. The final three studies assessed changes in EDA at AP Pts on the fingers and toes when different substances were placed in the electrical circuit with the patient. Conclusions: This review highlights the heterogeneity of approaches to EDA assessments and the discrepancies between common clinical practice and the scientific evidence to support that practice. It also provides pilot data that suggest EDA testing at Ear AP Pts may distinguish pathology-related AP Pts from non-pathology-related points; decreased skin conductance correlates with tiredness or low energy; and EDA testing at the ?Jing-Well AP Pts, on the tips of the fingers and toes, may assist in monitoring effectiveness of AP treatment. The evidence does not support the use of VEGA testing for allergic status. Filatov VI, Poriadin NF. The potentials of the reflexotest computer diagnostic system with patients suffering from kidney failure. Urol Nefrol (Mosk) 1996; 2:35-37. A study involving twelve patients with renal insufficiency demonstrated that patients who were responding well to treatment showed improvement of biologically active points, and those who were not responding well showed deterioration of biologically active points. Abstract: Computer diagnostic system (CDS) Reflexotest based on the Nakatani method with the use of IBM PC/AT personal computer noticeably facilitates data accumulation and processing. It is a new non-invasive and simple electrophysiological method providing information on the status of autonomic nervous system which is indirectly indicative of functional capacity of different organs and systems. CDS efficacy is illustrated on 12 cases with chronic renal insufficiency (4 patients in compensation, 8 in terminal stages) who demonstrated low mean potential of biologically active points (BAP) and unbalance of potentials specific for different meridians. In patients with positive treatment effects there was a tendency to better BAP parameters. Deterioration of clinical condition was also reflected by BAP evidence. CDS Reflexotest is recommended for practice as a promising adjuvant diagnostic method. Kail K. Clinical outcomes of a diagnostic and treatment protocol in allergy/sensitivity patients. Alternative Medicine Review 2001; 6(2):188-202. Electrodermal screening of acupuncture points were measured in allergy/sensitivity patients pre- and post-treatment which showed a change in measurements. For some patients conductance normalized and many that tested positive decreased compared to pre-treatment testing. Abstract: OBJECTIVES: This level II outcome study was conducted to examine the efficacy and toxicity of a diagnostic and treatment protocol using electrodermal screening (EDS) in allergy/sensitivity patients. METHODS: Ninety-six patients with a diagnosis of allergy or sensitivity entered the study between 1994 and 1998; 90 participants completed the study. All participants followed the same protocol, and all interactions were with a single clinician at a single site. The Allergy Symptom Severity Index (ASSI) was developed to record symptomatic information. EDS - conductance measurement 1/( - of specific acupuncture points was used as an objective endpoint (indicator of outcome) and for identification of antigens, according to Voll criteria. All measurements were taken before and after treatment, and EDS was carried out at all treatment sessions. Outcome criteria suggesting efficacy were reduction in ASSI score, reduction in number of items testing positive, and normalization of conductance measurements. A statistical analysis of the outcomes was performed using the student's paired t-test. RESULTS: There was a statistically significant change in pre- and post-treatment measurements of the ASSI. The conductance measurements normalized and the number of items testing positive decreased compared to pre-treatment testing. In addition to these parameters, 87.2 percent of subjects rated efficacy as good to excellent, and less than one-percent rated the outcome as poor. The outcome demonstrated longevity, meaning that people who had their post-treatment evaluation up to three years after primary treatment were still showing minimal ASSI scores, with no additional treatment. The treatment appeared to work equally well across age groups and gender. Forty-eight percent of participants had an aggravation of symptoms after treatment, lasting an average of 10 hours, with reactions described as mild to moderate. Average cost of the desensitization protocol (all costs included) was $822.16. CONCLUSIONS: This protocol demonstrated efficacy without serious toxicity and no long-term adverse effects. It is natural, non-invasive, and does not require long periods of avoidance of offending foods or environmental stimuli. The desensitization protocol is a low-cost, effective therapy for the treatment of patients suffering from symptoms of allergy/sensitivity disease. Kobayashi T. Cancer diagnosis by means of ryodoraku neurometric points. American Journal of Acupuncture 1984; 12(4):305-312. It is believed that electrical conductance patterns measured by Rydoraku theory show consistencies in patterns for patients with cancer of the kidney. Abstract: For the measurement of dysautonomia, a most effective method seems to be Rydoraku measurement. Statistics of 169 patients with malignancy demonstrated specific patterns on Ryodoraku charts. Abnormalities in six meridians (Pericardium, Heart, Triple Heater, Spleen-Pancreas, Kidney and Gallbladder) provide importance for cancer diagnosis. The method can reveal not only a highly significant difference between cancer and non-cancer groups, but it also provides a valuable judgment as to whether a cancer patient is improving or getting worse. Lee CT, Chang YH, Lin WY, Xu JM, Chen HY, Chou PL, Cheng CW, Chen YL, Lin FY, Tsai FJ, Huang HL, Man KM, Liu PL, Liu JT, Chen WC, Chen YH. Applications of meridian electrical conductance for renal colic: a prospective study. The Journal of Alternative and Complementary Medicine 2010; 16(8):861-66. A study designed to measure meridian electrical conductance of renal colic patients in the emergency room. The Meridian Energy Analysis Device (MEAD) was hypothesized to assist in accurate diagnosis. Abstract: Objective?Renal colic caused by ureteral stone is commonly encountered in the emergency department (ED).This study was designed to measure meridian electrical conductance of patients with ureteral stone in emergency settings. Design?A cohort of patients who had ureteral calculus and acute renal colic and who had visited the ED was enrolled in this study. A device, the design of which is based on the Ryodoraku theory, was used to measure the meridian electrical conductance of patients in the ED. Sixty (60) patients (aged 42.0_12.6 years) who had a primary ED diagnosis of ureteral calculus or renal colic were enrolled. Thirty (30) healthy volunteers (aged 40.8_11.7 years) were recruited to serve as controls. Results?Statistical analysis showed that (1) the average electrical conductance of the patient group was statistically lower than that of the control group ( p<0.01), (2) the average index of sympathovagal balance of the patient group was statistically higher than that of the control group ( p<0.01), (3) the average coefficient of variation of the electrical conductance and index of sympathovagal balance in the patient group was statistically different from that in the control group ( p<0.01), and (4) the patients who needed intervention had a higher autonomic nervous imbalance than the patients who had spontaneous stone passage ( p<0.01). Conclusions?measures of electrical conductance, especially the index of sympathovagal balance, may be used as valuable supplementary diagnostic methods for selective intervention in patients with acute renal colic. Margolin A, Avants SK, Birch S, Falk CX, Kleber HD. Methodological investigations for a multisite trial of auricular acupuncture for cocaine addiction: a study of active and control auricular zones. Journal of Substance Abuse Treatment 1996; 13(6):471-81. Active zones in the auricle possess lower electrical resistance and more subcutaneous ridges than the control zones. Abstract: We evaluated objective criteria for defining points for needle insertion prior to conducting a multisite clinical trial of auricular acupuncture for cocaine addiction. Thirty-four cocaine-abusing subjects participated in a study in which the trial's active zones (Shenmen, Liver, Lung, and Sympathetic) and control zones (located on the ear helix) were divided into quadrants and assessed along four dimensions: electrical resistance, skin discoloration, skin topography, and tenderness. Acute effects of needles inserted into points of low electrical resistance in one ear and high electrical resistance in the other were also assessed. Results showed that the active zones had lower overall electrical resistance and more subcutaneous ridges than control zones. Zones did not possess significant variability along any single dimension. Acute effects of needling high and low resistance points were similar, differing only for "fullness." Based on these findings, and in view of the difficulty of accurately measuring electrical resistance at ear points, we do not recommend the use of electrical devices for point determination in the multisite study. At present, there seems to be little scientific basis for the preselection of specific points for needle insertion within auricular zones. Needle placement should be based upon clinical judgment. Matsumoto T, Hanges MF. Acupuncture, electric phenomenon of the skin, and postvagotomy gastrointestinal atony. The American Journal of Surgery 1973; 125:176-90. The objective of this study was to evaluate the efficacy of acupuncture in the management of gastrointestinal atony after vagotomy. Electric permeability was reduced in certain gastric meridian points after vagotomy. Abstract: Skin resistance changed significantly at the meridian point after vagotomy in rabbits. Application of an acupuncture needle with electric stimulation on the meridian point minimizes the change of skin resistance. Reduction of gastrointestinal motility after vagotomy is also minimized by this application. Nagilla N, Hankey A, Nagendra H. Effects of yoga practice on acumeridian energies: Variance reduction implies benefits for regulation. Int J Yoga. 2013 Jan;6(1):61-5. A study of the effects of regular Yoga exercises on Qi and balance of acupuncture meridians. Abstract: Background and Objective: This paper concerns mechanisms responsible for the efficacy of yoga medicine, traditionally attributed to the enlivenment of prana. Our strategy was to investigate levels of Qi in acupuncture meridians, since Qi is usually considered equivalent to prana. Materials and Methods: Electrodermal measurements at acumeridian endpoints (Tsing points) were made on 32 healthy individuals, pre and post 3 weeks yoga lifestyle program using AcuGraph 3 (an instrument in wide use). A previous study found that inherent errors prevent AcuGraph from precisely evaluating Qi energies in single meridians, so group results are reported: (a) Energy levels, (b) energy stability, and (c) energy balance between (i) Yin/Yang meridians, (ii) upper and lower, and (iii) left and right regions of the body. Results: Significant improvements were observed in all but energy stability, supporting the ideas that yoga enlivens prana, and that balance in meridians constitutes health. For balance variables, the study observed shifts toward normal at both ends of variable distributions, reducing standard deviations: post-intervention percentages of subjects with values in the 'healthy' range increased. Conclusion: Yoga improved regulation of Qi levels in acumeridian meridians as well as increasing them. Oleson TD, Kroening RJ, Bresler DE. An experimental evaluation of auricular diagnosis: the somatotopic mapping or musculoskeletal pain at ear acupuncture points. Pain 1980; 8:217-29. Areas of the auricle where there is increased electrical conductivity and heightened tenderness to touch correspond to specific areas of the body where there is some pathological condition. Abstract: The present study was designed to experimentally evaluate the claims by French and Chinese acupuncturists that a somatotopic mapping of the body is represented upon the external ear. According to this system of diagnosis, areas of the auricle where there is increased electrical conductivity and heightened tenderness to touch correspond to specific areas of the body where there is some pathological condition. The hypothetical map of different bodily regions appears on the external ear as an inverted fetus, with the head represented towards the lower lobule, the hands and feet represented at the uppermost portion of the auricle, and the body in between. Forty patients were medically examined to determine areas of their body where there was musculoskeletal pain. Each patient was then draped with a sheet to conceal any visible physical problems. The physician conducting the auricular diagnosis had no prior knowledge of the patient's medical condition, but simply examined the patient's ear for areas of elevated skin conductivity or tenderness. The concordance between the established medical diagnosis and the auricular diagnoses was 75.2%. Both quantified readings of electrical current flow and subjective ratings of dermal tenderness were statistically significant in arriving at accurate diagnoses. These results thus support the hypothesis that there is a somatotopoic organization of the body represented upon the human auricle. Rosenblatt S. The electrodermal characteristics of acupuncture points. American Journal of Acupuncture 1982; 10(2):131-37. This study looks at the relationship between the changes in electrical skin conductance of specific acupuncture points on the heart channel in relation to increases and decreases in heart rate. Abstract: This study examines the electrical characteristics of skin sites at specific acupuncture points. In measuring changes in skin conductance at acupuncture points on the forearm, it was found that points on the Heart meridian reflected changes in the heart rate. As the heart rate increased or decreased, there was a corresponding increase or decrease in skin conductance but only at points on the heart meridian. Conversely, it was found that if the skin conductance at the point Heart 7 was increased or decreased there would be corresponding change in the heart rate. This study provides the first firm evidence of direct correspondence between electrical activity at the acupuncture points and internal body changes. In addition, it shows that the effect is reversible and symmetrical. Saku K, Mukaino Y, Ying H, Arakawa K. Characteristics of reactive electropermeable points on the auricles of coronary heart disease patients. Clinical Cardiology 1993; 16:415-19. Reactive electropermeable points on the auricle were measured on patients with coronary heart disease, showing high readings for auricular points Heart 1 and Heart 2, including significant increased readings for patients with old myocardial infarction and angina pectoris. Abstract: In oriental medicine there is a hypothesis related to acupuncture that the auricle is a projection of the functional anatomy of the whole human body. In this study reactive electropermeable points (REPP), that is, points on the skin with low electrical resistance, on the auricle were measured on patients with coronary heart disease using a neurometer LC-M. Our findings correlated positively with the particular points--heart I (shin) and heart II (shinzo)*--named by the Chinese group as being related to the functional anatomy of the heart. The incidence of positive REPP test results at the shin and shinzo points for subjects with acute myocardial infarction (AMI) were extremely high, and positive test results for patients with old myocardial infarction (OMI) and angina pectoris (AP) were also significant. There was no significant difference in the incidence rates of REPP at the shin and shinzo points between the OMI and AP groups. High incidence of positive REPP test results at the lung and heart III (shinyu) points occurred only in the AMI group, and this was significantly high when compared with the control group. Sullivan SG, Eggleston DW, Martinoff JT, Kroening RJ. Evoked electrical conductivity on the lung acupuncture points in healthy individuals and confirmed lung cancer patients. American Journal of Acupuncture 1985; 13(3):261-66. Distal lung acupuncture points may hold diagnostic information for patients with a diagnosis of lung cancer. Abstract: The purpose of this study was to determine if the evoked electrical conductivity at the distal lung acupuncture points differs significantly between controls and subjects with confirmed lung cancer, four subjects and twenty-six controls were blindly measured with an electroacupuncture point measuring device. Twenty-six of the thirty examinations matched the results of the chest-x-rays, four true positives, twenty-two true negatives, four false positives, and zero false negatives. The data indicate a significant level of agreement exists (p < 0.2) between the electroacupuncture point measurements and the chest x-rays. Further research into the diagnostic significance of electrical conductivity at acupuncture points seems warranted. Szopinski J, et al. Influence of general anesthesia and surgical intervention of the electrical parameters of auricular organ projection areas. Medical Acupuncture 2002; 14(2):40-42. Pathology of internal organs causes a decrease of skin impedance in organ projection areas (acupuncture points) in comparison to control points. The degree of impedance indicates the extent of the pathology. Manipulation of diseased organs caused a significant increase in the rectification ratios. Abstract: Objectives: To confirm the skin electrical rectification phenomena experimentally, and to determine the influence of state of consciousness. Main Outcome Measures: The ratio of the skin resistance measured at the organ projection areas (OPA) before, during, and after surgery with a negatively polarized point electrode to the skin resistance, measured at the same area with the same electrode polarized positively (after obtaining the breakthrough effect). Results: The degree of rectification measured at OPAs related to diseased organs was significantly (P<.001) higher than at OPAs related to healthy organs. Premedication, general anesthesia, and skin incision did not influence the results. A rapid and statistically significant (P<.001) increase in the degree of rectification was observed at OPAs undergoing direct surgical intervention. Patient consciousness did not affect the findings. Conclusion: Organ projection areas (acupuncture points) exist on the skin surface. Damage to an internal organ causes an immediate increase in the degree of electrical rectification exhibited by the related projection areas. State of consciousness does not affect this phenomenon. Szopinski J, Pantanowitz D, Jaros G. Diagnostic accuracy of organ electrodermal diagnostics. SAMJ 1998: 88 (2): 146-50. The organ electrodermal diagnostic results obtained in this study confirmed the existence of so-called organ projection areas on the skin surface. The location of electrical resistance asymmetry and increased impedance areas on the skin surface, although often remote, may indicate which organs are involved in the pathological process. The degree of asymmetry or the difference in impedance may indicate the activity of disease. Abstract: OBJECTIVE: To estimate the diagnostic accuracy and the scope of utilization of a new bio-electronic method of organ diagnostics. DESIGN: Double-blind comparative study of the diagnostic results obtained using organ electrodermal diagnostics (OED), with clinical diagnosis as the criterion standard. SETTING: Department of Surgery, Helen Joseph Hospital, Johannesburg. PATIENTS: Two hundred pre-selected inpatients of mean age 38 years (standard deviation 9 years) with suspected pathology of one (or more) of the following organs: esophagus, stomach, gallbladder, pancreas, colon, kidneys, urinary bladder and prostate. In total, 714 of the abovementioned internal organs were selected for statistical consideration. MAIN OUTCOME MEASURES: The degree of rectification of the measuring current once the resistance 'breakthrough effect' has been induced in the skin, as well as the difference in impedance measured at organ projection areas (OPAs) (skin zones corresponding to particular internal organs). RESULTS: In total, 630 true OED results were obtained from the 714 subjects considered, with a detection rate of 88.2% (95% confidence interval (CI): 85.6 - 90.5%). Established OED sensitivity was 89.5% (CI: 85.2 - 92.8%) and OED specificity equaled 87.5% (CI: 84.0 - 90.4%). The predictive value for positive OED results was 81.7% (CI: 76.9 - 85.9%) and for negative OED results 93.0% (CI 90.1 - 95.2%). Healthy organs usually produced the OED result 'healthy' or 'within normal limits', while subacute pathology displayed 'subcute' and acute pathology 'acute'. The OED results were not affected by either the type or the etiology of disease, i.e. OED estimated the actual extent of pathological process activity within particular organs but did not directly explain the cause of pathology. CONCLUSIONS: So-called OPAs do exist on the skin surface. Pathology of a particular organ causes a related OPA to rectify electrical currents once the resistance 'breakthrough effect' has been induced in the skin. Pathology of an internal organ also increases the impedance of the corresponding OPA. The degree of rectification or difference in impedance is proportional to the extent of the pathological process within this organ. OED which utilizes the abovementioned electrical phenomena of the skin, is a reliable bio-electronic method of non-invasive medical diagnostics, with high rates of sensitivity, specificity and predictive values. OED may be used to detect diseased organs and estimate the extent of pathological process activity. Electrodermal measurements of organ projection areas on the skin showed a high correlation with breast pathology in 400 females at 3 academic breast clinics. Abstract: Objective: Pathology of an internal organ/body part causes corresponding skin areas—organ projection areas/acupuncture points—to rectify applied electrical currents (a diode phenomenon) once the resistance "breakthrough effect" has been induced in these specific, and sometimes remote, skin zones. The aim of this study was to estimate the diagnostic accuracy—as well as the scope of utilization—for detection of breast pathology of organ electrodermal diagnostics (OED), which utilizes this electrophysiologic phenomenon. Materials and Methods: A multicenter randomized, double—blinded comparative study of OED results and clinical diagnoses, as the criteria standards, was done on 400 female volunteers, with a mean age of 39 (standard deviation: 9 years), at three academic breast clinics. Participants were divided into 7 groups: (1) a control group; (2) a cancer—survivor group; (3) a breast—fibroadenoma group; (4) a mastitis group; (5) a breastabscess group; (6) a preinvasive breast—cancer group; and (7) an invasive breast—cancer group. Results: The OED overall detection rate was 88.8%, the sensitivity rate was 92.7%, and the specificity rate was 76.5%. The predictive value for positive OED results equaled 92.4% and, for negative OED results, equaled 77.3%. However, both sensitivity and specificity rates varied among specific groups. The highest sensitivity rates were shown by OED in groups with serious pathologies, such as invasive cancer (94.2%), preinvasive cancer (90.0%), breast abscess (94.4%), and mastitis (95.9%). The OED results correlated with the intensity of the pathologic process within breasts but were not affected by either the type or the etiology of the disease. Conclusions: OED appears to be a reliable method for detecting breast pathology; this method might also estimate the intensity of a breast pathologic process but cannot explain the cause of the disease directly. Szopinski JZ, Pantanowitz D, Lochner GP. Estimation of the diagnostic accuracy of organ electrodermal diagnostics. South American Journal of Acupuncture 1984; 13(1):305-12. A study to evaluate the diagnostic accuracy of organ electrodermal diagnostics, using a CE certified automated OED device. Abstract: OBJECTIVE: To estimate the diagnostic accuracy and the scope of utilization of a new bio-electronic method of organ diagnostics. RESULTS: In total, 630 true OED results were obtained from the 714 subjects considered, with a detection rate of 88.2% (95% confidence interval (CI): 85.6 - 90.5%). Established OED sensitivity was 89.5% (CI: 85.2 - 92.8%) and OED specificity equaled 87.5% (CI: 84.0 - 90.4%). The predictive value for positive OED results was 81.7% (CI: 76.9 - 85.9%) and for negative OED results 93.0% (CI 90.1 - 95.2%). Healthy organs usually produced the OED result 'healthy' or 'within normal limits', while subacute pathology displayed 'subcute' and acute pathology 'acute'. The OED results were not affected by either the type or the etiology of disease, i.e. OED estimated the actual extent of pathological process activity within particular organs but did not directly explain the cause of pathology. CONCLUSIONS: So-called OPAs do exist on the skin surface. Pathology of a particular organ causes a related OPA to rectify electrical currents once the resistance 'breakthrough effect' has been induced in the skin. Pathology of an internal organ also increases the impedance of the corresponding OPA. The degree of rectification or difference in impedance is proportional to the extent of the pathological process within this organ. OED which utilizes the abovementioned electrical phenomena of the skin, is a reliable bio-electronic method of non-invasive medical diagnostics, with high rates of sensitivity, specificity and predictive values. OED may be used to detect diseased organs and estimate the extent of pathological process activity. Tiller W. What do electrodermal diagnostic acupuncture instruments really measure? American Journal of Acupuncture 1987; 15:15-23. A history of large and small electrode studies which led to commercial devices which measure skin resistance, along with a discussion of experimental data relating electrical skin resistance findings to the condition of the internal organs. Abstract: What do electrodermal diagnostic acupuncture instruments really measure? How do they differ from one another? Can one really expect to make experiments on the skin and say something meaningful about the condition of specific internal organs? Is there any evidence that such measurements do provide an early warning system of body pathology? The purpose of this paper is A) to provide some answers to these questions by relating some of the history of large electrode studies followed by a brief discussion of the Schimmel commercial device that utilized some of this basic information; and B) relate some of the history of the small electrode studies on acupuncture points which led to Nakatani, Voll and Motoyama commercial devices. This is followed by a brief discussion of some experimental data and theoretical speculation concerning possible connections between specific skin points and specific internal organs. Finally one example of early detection of cancer using the Nakatani device is identified. Tsuei JJ, Lam Jr. FMK, Mi MP, Zhao Z. Studies on bioenergy in diabetes mellitus patients. American Journal of Acupuncture 1989; 17:31-38. A study was done to critically compare diabetic patients with healthy subjects with various bioenergetics measurements of the whole-body and specific point locations. Abstract: The purpose of this article is to demonstrate two differences between diabetes mellitus patients and healthy subjects: 1) The bioenergetic measurement of electroacupuncture points and 2) the energy changes in diseased organs. In this phase of study, the authors chose diabetes mellitus because of the accuracy of diagnosing established diabetic patients. The data was analyzed by discriminant analysis which showed a 95 to 97.5% correct classification rate by test. Voll R. Twenty years of electroacupuncture diagnosis in germany. a progress report. American Journal of Acupuncture 1975; 3:7-17. A twenty year progress review regarding Electroacupuncture According to Voll?EAV. Abstract: This paper describes a successful variation of electroacupuncture in which the skin resistance of individual acupuncture points is precisely measured. EAV (Electroacupuncture According to Voll) permits the practitioner an accurate diagnosis and hence emphasizes preventative medicine. EAV diagnostic methods make it possible to confirm therapeutic progress at every stage as well as to monitor therapeutic failure. The method is useful in cardiology, angelology, pulmonology, gastroenterology, hepatology, urology, gynecology, otorhinolaryngology, endocrinology, orthopedics, dermatology, neurology, dentistry, and ophthalmology. EAV Diagnostics as an Advance Diagnosis: EAV diagnostics makes possible an early diagnosis, and hence accomplishes preventative therapy. It should always be kept in mind that every pathological change is preceded by a longer stage of disturbed electrical potential, which comes from the histological changes occurring in the cells. The pathology of the electrical potential in the organs expands diagnostic and therefore therapeutic possibilities. Voll R. Verification of acupuncture by means of electroacupuncture according to voll. American Journal of Acupuncture 1978; 6(1):5-15. Voll claims to prove the existence of 800 acupuncture points, in which electrical potential can be measured, for diagnostic purposes. Abstract: Every illness needs time to develop. The energetic alterations caused by every life process which, after exceeding certain limits leads to sickness, can be detected by Electroacupuncture According to Voll (EAV) in their very beginnings. Long before the patient himself is aware of a pathological process and long before most of the clinical data can be obtained, EAV can come forth with results. What is more, the technique can differentiate precisely between acute subacute, and chronic inflammation, between initial progressed, or final degenerative stages, and between the simultaneous occurrences of inflammatory and degenerative processes in an organ. Since EAV can establish an immediate case diagnosis based entirely on objective measurement readings of acupuncture points, this can be taken as proof for the verification of acupuncture. "EAV can establish an immediate case report without prior access to the history of the patient, that is, based entirely on measurement readings, whereby location, severity of the affliction, the radiation into adjacent areas, and the remote effects of the disturbance may be diagnosed in addition to latent initial diseases, and when the diagnosis thus established, coincides with findings from clinical examination (apart, of course, from the very initial stages), this can be taken as proof for the verification of acupuncture." Zytkowski A. Electrodermal method of ryodoraku—an attempt at clinical measurement for evaluation of physiotherapy effects in patients with low back pain. Neurol Neurochir Pol 1999; 32(6):207-15. For sciatic nerve patients, significant electrical conduction differences were found between the pathological side of the body and the other half of the body. Abstract: In the group of 132 patients with diagnosed pseudoradicular pain syndrome (57 subjects) or evident sciatic neuralgia (75 subjects) besides clinical and radiological examination, additional skin electro-conduction evaluation, being the sympathetic system activity exponent, was performed. Diagnostic part of empiric method of Yoshio Nakatani, was adapted, where the skin electro-conduction measurement of the direct current of 200 microAmps in 24 representative measuring points is the essence. The aim of this study was the analysis of electroconductivity in dermatomes corresponding to the level of discopathy and indirect trial of objectivisation of some widely applied in this group of patients physiotherapeutical methods: low frequency diadynamic currents (Bernard's), medium frequency interferential currents (Nemec's), low frequency impulse magnetic field and classic acupuncture. In the case of sciatic neuralgia statistically significant electroconductional differences were found in the range of dermatomes involved in pathological process in comparison to the other half of the body as well as other points of reference. Colbert AP, Spaulding KP, Ahn AC, Larsen A, Cutro JA. Electrodermal activity at acupuncture points: literature review and recommendations for reporting clinical trials. Jacupunct Meridian Stud 2011; 4(1):5-13. Using the Quality of Reporting scale, electrodermal activity data was evaluated to show that standardized research methodology and reporting protocols are needed for future clinical trials. A checklist of recommended informational items was proposed. Abstract: Electrodermal activity (EDA) at acupuncture points (acupoints) has been investigated for its utility as a diagnostic aid, a therapeutic monitoring tool, and a physiological outcome measure. The research methodologies reported in published trials, however, vary considerably and publications often lack sufficient details about electrical instrumentation, technical procedures, laboratory conditions, recorded measures, and control comparisons to permit a critical appraisal of the studies or to replicate promising findings. We developed a 10-category (54 subitems) Quality of Reporting scale based on technical issues associated with EDA measurements, publication requirements for reporting EDA in the psychophysiological literature, and recommendations from the CONSORT Statement for reporting clinical trials. Using our Quality of Reporting scale, we extracted data from 29 studies that evaluated EDA at acupoints in patients and generated weighted scores for each of the 10 categories of essential information. Only 9 of the 29 studies reviewed scored a mean of greater than 50% for reporting details of essential information. To rigorously build a program of research on EDA at acupoints we need to standardize research methodology and reporting protocols. We propose a checklist of recommended informational items to report in future clinical trials that record EDA at acupoints. Halek J, Opavsky J, Kolarova J. Problems of the skin resistance measuring in randomly chosen and so-called active points of the skin. Acta Universitatis Palackianae Olomucensis-Tom 107 Facultatis Medicae 1984; 107:51-62. A study which addresses a problem of reproducibility and comparability of assessed values for electrical skin resistance testing in relation to different electrode pressure on the skin surface. Abstract: Summary: The authors investigate the problems of assessment of resistance in active points of the skin. They evaluated the effect of some factors on the reproducibility and comparability of the assessed values. Attention was focused in particular on the problem of different electrode pressure on the skin surface (constant, intermittent pressure or its elimination), on the dependence on the area and shape of different electrodes, the problem of migration of the active point, perspiration and the effect of treatment of the skin before the measurements were taken. The assembled results revealed for individual factor relationships which must be taken into consideration in these measurements. The authors mention also other factors which influence values of skin resistance. They discuss problems of elimination or restriction of different factors to render reproducible and comparable measurements of active skin points possible. Noordergraaf A, Silage D. Electroacupuncture. IEEE Trans Biomed Eng 1973; BME 20(5):364-66. An argument against the validity of measured skin resistance. Abstract: This research paper questions the clinical relevance of measured skin resistance—based on a clinical trial carried out by a physician showing that resistance can be altered with pressure. "Indeed, the physician-expert in electroacupuncture, who participated in this study, utilized the full range of possibilities offered by the set of conditions: He manipulated the electrode, puncturing the skin on occasion, while reading the resistance values on a meter before deciding on a final value. Inasmuch as this procedure appears to be acceptable practice, it is concluded that no evidence whatsoever has been produced on the basis of which even the mere existence of electroacupuncture points might be argued." Wong F, Lim C, Smith W. A new bioimpedance research device (BIRD) for measuring the electrical impedance of acupuncture meridians. The Journal of Alternative and Complementary Medicine 2010: 16 (3) 257-264. The aim of the article is to introduce a new device that uses an old but flexible impedance measuring technique and to present some preliminary findings to serve as a basis for new approaches toward investigation of the electrical properties of the acupuncture meridians. Abstract: OBJECTIVES: The aim of this article is to introduce an electrical bioimpedance device that uses an old and little-known impedance measuring technique to study the impedance of the meridian and nonmeridian tissue segments. DESIGN: Three (3) pilot experimental studies involving both a tissue phantom (a cucumber) and 3 human subjects were performed using this BIRD-I (Bioimpedance Research Device) device. 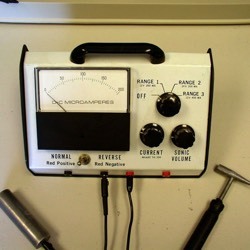 This device consists of a Fluke RCL meter, a multiplexer box, a laptop computer, and a medical-grade isolation transformer. Segment and surface sheath (or local) impedances were estimated using formulae first published in the 1930s, in an approach that differs from that of the standard four-electrode technique used in most meridian studies to date. RESULTS: Our study found that, when using a quasilinear four-electrode arrangement, the reference electrodes should be positioned at least 10 cm from the test electrodes to ensure that the segment (or core) impedance estimation is not affected by the proximity of the reference electrodes. A tissue phantom was used to determine the repeatability of segment (core) impedance measurement by the device. An applied frequency of 100 kHz was found to produce the best repeatability among the various frequencies tested. In another preliminary study, with a segment of the triple energizer meridian on the lower arm selected as reference segment, core resistance-based profiles around the lower arm showed three of the other five meridians to exist as local resistance minima relative to neighboring nonmeridian segments. The profiles of the 2 subjects tested were very similar, suggesting that the results are unlikely to be spurious. CONCLUSIONS: In electrical bioimpedance studies, it is recommended that the measuring technique and device be clearly defined and standardized to provide optimal working conditions. In our study using the BIRD I device, we defined our standard experimental conditions as a test frequency of 100 kHz and the position of the reference electrodes of at least 10 cm from the test electrodes. Our device has demonstrated potential for use in quantifying the degree of electrical interconnection between any two surface-defined test meridian or nonmeridian segments. Issues arising from use of this device and the measurement Horton and van Ravenswaay technique were also presented. All Content Copyright © 2011-2018 Miridia Technology, Inc. All Rights Reserved.